OSU freshman forward Mickey Mitchell (00) takes the ball up the court during a game against Maryland on Jan. 31 at the Schottenstein Center. Mickey Mitchell’s time at Ohio State began a few weeks late, and it is ending a few years early. 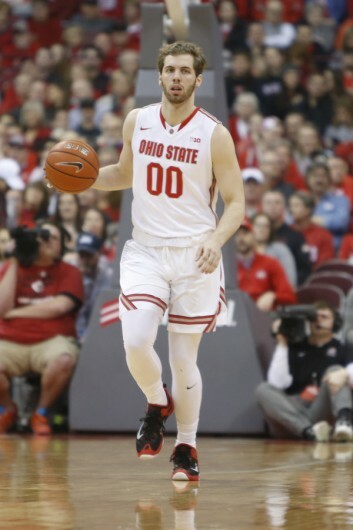 According to multiple media reports first published by Jon Rothstein of CBS Sports, the freshman forward will seek a transfer from the OSU men’s basketball program after one season. The reports were later confirmed to The Lantern by an OSU spokesman. This comes fresh off the heels of fellow class of 2015 recruit Daniel Giddens requesting a release from the program on Monday. Combined with Austin Grandstaff’s departure in December, three of the five true freshmen on the team during the 2015-16 season will no longer be with the team for their final three years of eligibility. There have been rumors that freshman point guard A.J. Harris could follow Giddens and Mitchell out the door as well, which would leave point guard JaQuan Lyle as the last man standing of the five-player recruiting class. Lyle reiterated on Twitter after Giddens’ decision that he plans to remain a Buckeye next season. Mitchell, a native of Plano, Texas, saw his college career get off to a rocky start when he was ruled ineligible by the NCAA and was unable to suit up for the Buckeyes for the first month of the season. After making his debut in OSU’s 12th game, Mitchell went on to average 2.0 points and 2.8 rebounds per game. He started the final seven games, stepping into the starting lineup after sophomore forward Jae’Sean Tate went down for the season with a shoulder injury. Mitchell’s play is notable for his ability to handle the ball at 6-foot-7 and his flashy passes, but he never truly settled into the offense, hitting multiple field goals on only six occasions. He finished the season shooting 35.4 percent from the field and shot just 12-of-23 from the free-throw line. Though the Buckeyes are likely to lose no rotation players to graduation or the NBA draft, the exodus of Mitchell, Giddens and, possibly, Harris do hurt their depth for next season. Fortunately for OSU coach Thad Matta, two bigs, Derek Funderburk and Micah Potter, have already committed, and OSU has more open scholarships available. Good riddance he is a monster that hit a kid so hard he gave him brain damage. Glad he and his a hole brother left. He should be in prison.